The banner image is from 'The East Indiaman Mellish entering the harbour of Sydney' (hand-coloured aquatint by Edward Duncan, circa 1830; National Library of Australia). The Mellish was the ship on which my ancestor John Gale sailed from England to Calcutta in 1804 as a Cadet in the East India Company Army, beginning more than a century and a half of involvement in India for his descendants. These arms were granted by the College of Arms to my ancestor John Gale of Whitehaven and his brothers in 1712. They were sea-captains, and the anchor represents their profession. This is a hand-coloured image from Howard and Crisp's Visitation of 1893 (see also below under Gale family). You can read a transcript of the original Grant of Arms here. My interest in family history began as a boy when my father showing me a page of notes dictated by his grandmother shortly before her death in 1964. She had been born in India in 1881, the daughter of a Royal Engineers colonel, and knew details of her mother's Scottish background including a connection with the French Empress Eugenie's Kirkpatrick forbears. I was fascinated by this and began researching in our local university library in Guelph in Canada, by chance one of the largest repositories of Scottish genealogical material anywhere. I established that my great-grandmother was the fourth generation of her father's family to have been in India, the first having arrived as an officer in the East India Company army in 1804, and that their ancestors had been English sea-captains and traders with the Americas whose lineage could be traced back to the 15th century. She knew that she had a Portuguese Jewish great-grandmother, who I discovered was the wife of the East India Company officer. I confirmed that her maternal grandfather, a Scottish cavalry captain who had fought in the Indian Mutiny, was indeed descended from a Kirkpatrick - a Jacobite, executed after the Rebellion of 1745 - who was also an ancestor of Eugenie, and through him I was able to connect with the Kirkpatrick genealogy stretching back to the time of Robert the Bruce in the 13th century and the Normans. 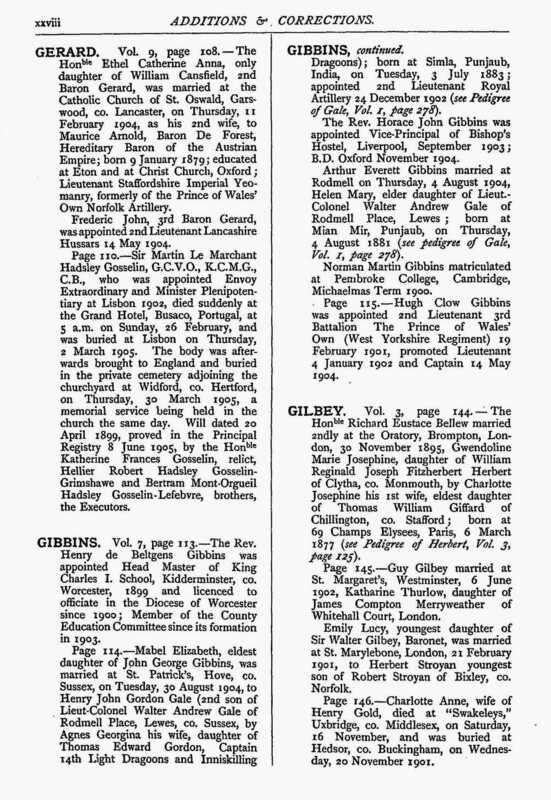 Later I was also able to research my Gibbins forbears, originally Huguenots - probably from north-west France - who were well-established by the early 19th century in London, where my ancestor Samuel Gibbins was a Common Councillor of the City of London and Master of the Carpenters' Company. Over the years I've continued to add more when I've found the time, aided recently by the internet - mainly by the increasing numbers of out-of-copyright books, newspapers and other primary source materials now available online. I have a particular interest in military biographies - at last count almost thirty of my ancestors and their brothers in the 19th century were soldiers, many of them in India - and in the history of colonial war and exploration. Some of my ancestors have been the inspiration for fictional characters in my novels. In The Last Gospel, I used the life-stories of my great-grandfather, an architect who converted to Roman Catholicism and emigrated to America, and his brother, a wounded First World War veteran and Cambridge mathematician, to create a character central to my story of the discovery of an ancient manuscript from the time of Christ. In The Tiger Warrior, the first part of the novel is set during a jungle rebellion in India in 1879 where my Royal Engineers ancestor served as a young officer, and he and one of his comrades appear in fictionalised form there and years later in the story - based on their actual careers in southern India and on the North-West Frontier. The same character appears again in my novel Pharaoh, part of which is set in 1884 during the disastrous attempt to rescue General Gordon in Khartoum, a setting also for an archaeological revelation in the story. As an archaeologist I'm especially fascinated by artefacts from my family's past - this sword gauntlet brought back by my great-great grandfather from India in the 19th century features in my novel The Tiger Warrior. This page contains summaries of the main lines of descent for each family as well as printed pedigrees and reference to online resources. By reading down the page you can see how the families link together, with reference back to key individuals in previous sections. Most of what you see here is based on genealogies compiled in the 19th century or before, and much of that is supported by primary documentation - correspondence and other records - that still survives in family and public archives, including extensive collections for the Gale, Gordon, Kirkpatrick and Hunter families. Reference to online resources is generally restricted to old books and other documents that can be seen in their original form, though in two cases - for the Gale and the Kirkpatrick families - I've linked to websites by other family history researchers that I've found to be authoritative. I'd originally intended only to include on this website blogs on family history material where it related to the novels, but I've now decided that this is a good place to present some of this material in its own right. What you see here only represents a small fraction of my research to date and is skewed towards things that happen to have interested me most over the past couple of years while I've been developing this website, particularly the Projects below. I'll be adding new material to this page mainly as blogs tagged under the family headings; some will also be tagged under military biographies. I'll be adding more portraits and other images too, mostly within the blogs. I'm always on the look out for further material, particularly old photographs, and I'll be very pleased to hear from relatives and others via my contact page who might have anything to add. Click on the images below to open up separate pages on areas of particular interest to me recently. 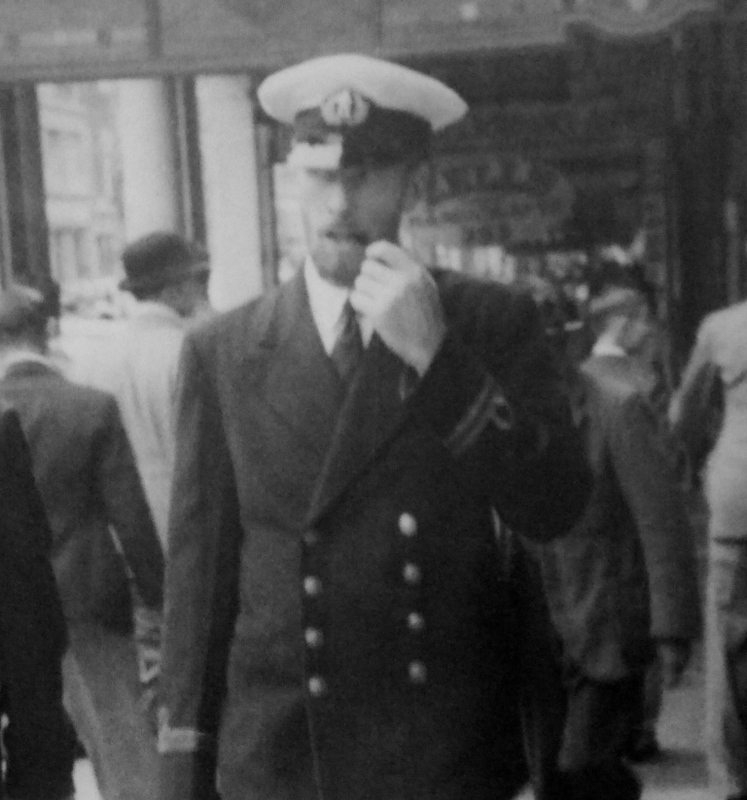 The first is on my grandfather Captain Lawrance Wilfred Gibbins' Second World War experience as a Merchant Navy officer, including blogs detailing his involvement in assault convoys for the 1943 invasion of Sicily and the 1944 invasion of the South of France. The second is on his grandfather Colonel Walter Andrew Gale's service with the Rumpa Field Force, deployed in 1879 to suppress a tribal uprising in the jungle of southern India where the British witnessed the resurgence of 'meriah', human sacrifice. These projects entailed considerable research in the UK National Archives and the Oriental and India Office of the British Library, and both have fed into my fiction. Clicking on the third image will take you to a page on which other blogs related to the military history of my family are collated. More will be added to all three of these pages as I find time. The image opposite shows the campaign medals of my great-great-great grandfather Captain Thomas Edward Gordon, 14th Light Dragoons, who fought in the Punjab War of 1848-9, the Indian Mutiny and the New Zealand War of 1866. My great-great-great grandfather Samuel Gibbins, photographed on becoming a Common Councillor of the City of London in the 1860s. 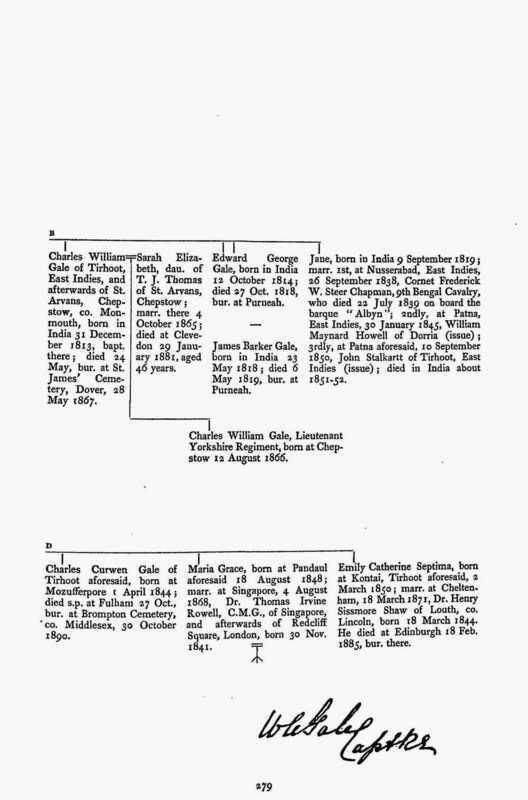 The following family tree appears in Volume 7 of Howard and Crisp's Visitation of England and Wales, a massive 33 volume series of family trees and genealogical notes published between 1893 and 1921. Joseph Jackson Howard, LL.D, was Maltravers Herald Extraordinary, and Frederick Arthur Crisp was the publisher. Most of the families represented would have considered themselves part of the affluent middle class of the later Victorian age. In this tree (extending over three pages, and meant to be seen as one continuous chart) you can trace the descent from my four-times great grandparents, the elder Samuel Gibbins and Mary Hatch, to my great-grandfather, Arthur Everett Gibbins, shown towards the bottom of the second page. The elder Samuel Gibbins, born in 1775 or 1776, is the earliest Gibbins ancestor known to me, though my great-grandmother knew that the Gibbins family had come over to England with the Huguenots (in which case the original French name might have been Guibon, or similar). Samuel was a hairdresser and perfumer, a profession he passed on to his son Henry James Gibbins who prospered in Westminster in London in the early 19th century and became a prolific watercolourist; his brother, also Samuel (1808-86), pictured opposite, ran a large wool warehouse near St Paul's Cathedral in the City of London, where he became a Common Councillor and Master of the Carpenters' Company. Two of the younger Samuel's sons followed him into the textile trade, moving to Yorkshire to manage mills, but his second son, my great-great grandfather John George Gibbins (1843-1932), trained as an architect and moved to Brighton, where he designed many churches, houses and public buildings, becoming a Fellow of the Royal Institute of British Architects. His wife, Octavia Everett, was from a prosperous family of clothiers in Heytesbury, Wiltshire, and descended from several prominent settlers of early colonial America including John Cotton. Of their three sons, one, Horace, went to Oxford University and became an Anglican priest; another, Norman, was a Maths 'wrangler' at Cambridge University - achieving a first-class degree - and became Headmaster of Central Foundation School in London, after serving in the Great War as an officer in the Royal Dublin Fusiliers; and a third, my great-grandfather Arthur Everett Gibbins (1879-1956), went into practice with his father as an architect in Brighton, where he was living when my grandfather was born in 1908. One of their cousins, son of one of their Yorkshire uncles, was Dr Henry de Beltgens Gibbins, who published many books on British economic and social history. 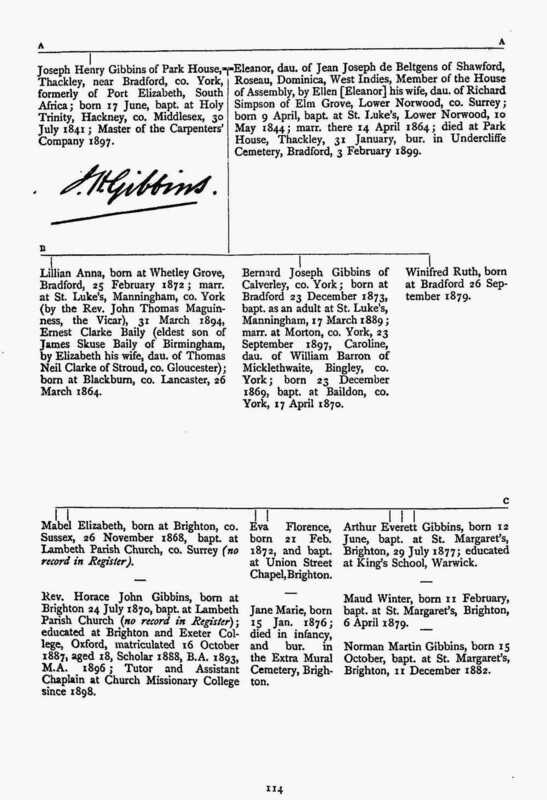 This tree was published in 1899, but updates provided in subsequent volumes included the marriage of Arthur Everett Gibbins to Helen Mary Gale in 1904, shown in the fourth image. A further update in the 1908 volume showed the birth of their second son, my grandfather Lawrance Wilfred Gibbins. The family trees in Howard and Crisp are of particular interest for the inclusion of signatures, showing that the families involved must have provided Howard with considerable documentation and source material at his request. The entire series of Howard and Crisp's Visitation can be read online here. Click on these images to enlarge. This Victorian brooch from my great-grandmother shows the unicorn and anchor of the Gale coat of arms, and the motto Depressus Extollor ('Having been depressed, I am exalted'). My great-grandmother, Helen Mary Gibbins - who left the family history notes that inspired my research - was born a Gale, the daughter of Colonel Walter Andrew Gale (1855-1924) and Agnes Georgina Gordon (1856-1933). You can see her marriage to Arthur Everett Gibbins, my architect great-grandfather, in the pages above. Howard and Crisp's Visitation also contains the pedigree for the Gale family that you can see below, tracing their descent from my four-times great grandfather Lieutenant-Colonel John Littledale Gale of the Bengal Army (1783-1832) and his Portuguese Jewish wife Rebecca Brandon down to Helen Mary Gale, who you can see on the second page. The fortune of the Gale family in India in the 19th century derived from the indigo plantation in Bihar owned by my great-great-great grandfather, also named John Gale (1809-1886), allowing him to retire to England a wealthy man and live in a large house in Cheltenham. You can read a delightful reminiscence of him by a fellow-planter here. 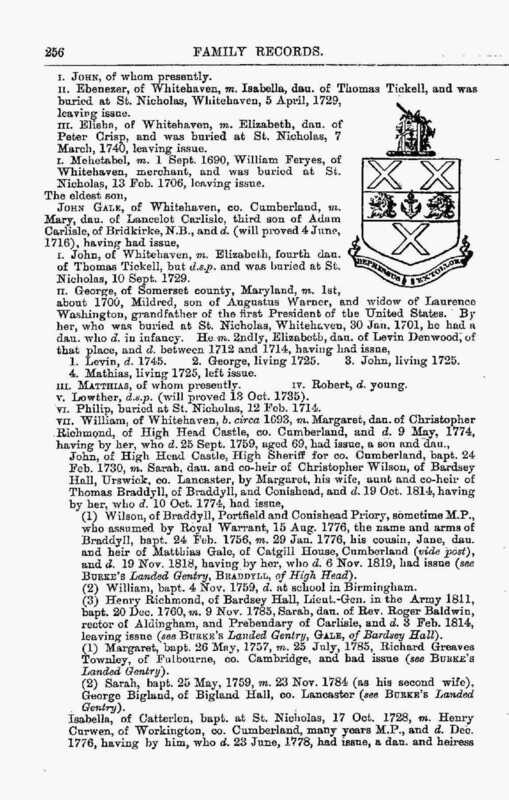 This tree appeared in the first volume of the Visitation, published in 1893, and is complemented by additions and updates in subsequent volumes to 1921, as well as by a large amount of supporting material - the 1712 Grant of Arms, transcriptions of Wills, and 19th century monumental inscriptions - all of which can be seen in full here. Howard's correspondent in the family for this material may have been my great-great grandfather Colonel Walter Andrew Gale, who published articles in Miscellanea Genealogica and left his genealogical collection to one of his nephews. Click on these and the following images to enlarge. The chart in Howard and Crisp's Visitation begins with my four times great grandfather, Lieutenant-Colonel John Littledale Gale, born in 1783. 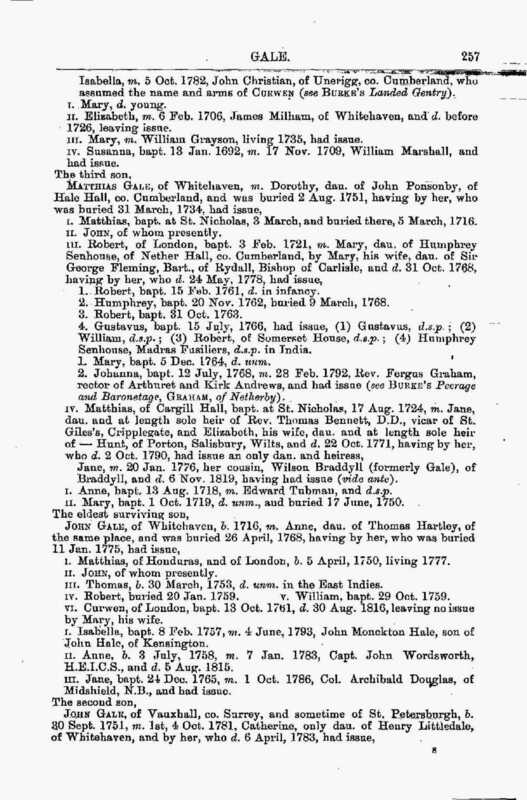 His ancestors back to the 16th century are listed in the more extensive pedigree reproduced below from Burke's Family Records (1897), which can also be viewed online. 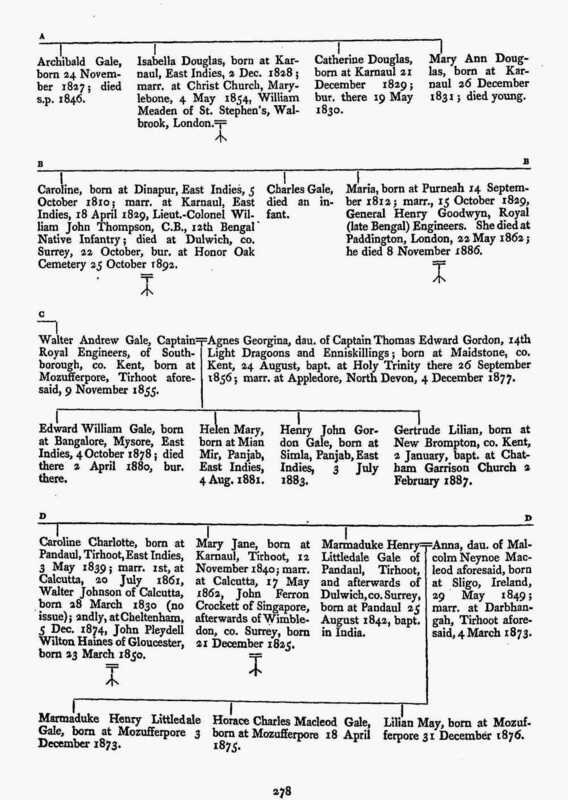 The Family Records was meant to complement Burke's Peerage and Landed Gentry by showing the descent of prominent families who happened not to have inherited titles or land. In these five pages you can trace the descent from Robert Gale, an Englishmen living in Ireland about the time of Queen Elizabeth I, all the way to my great-grandmother Helen Mary Gale on the final page. 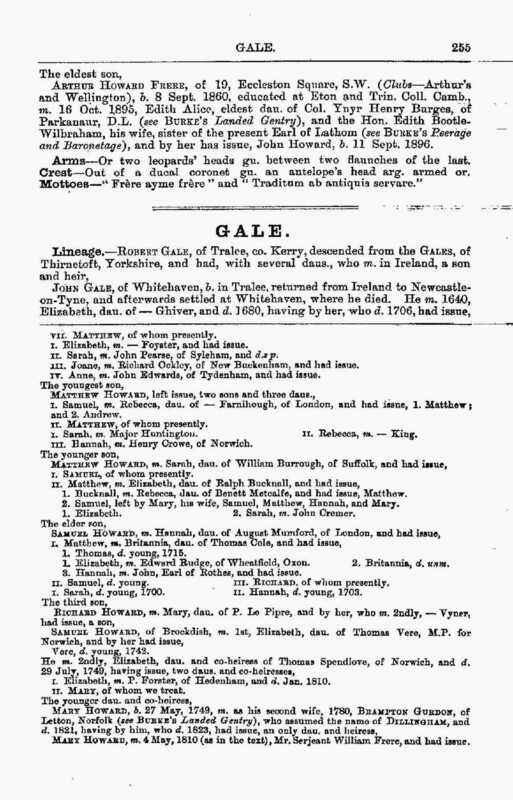 At the beginning of the pedigree Burke notes that Robert Gale was descended from the Gales of Thirnetoft in Yorkshire. Several earlier generations are listed in The Visitation of Yorkshire in the Years 1563 and 1564. In the image opposite you can see Robert, at the bottom, and his descent from his great-grandfather 'Olyver Gale of Thyrnetoft.' The description of the coat of arms shows that the arms granted to John Gale in 1712 (see the illustration above) were closely based on those of the mediaeval Gale family, with the addition of the anchor that undoubtedly represented his seafaring interests. As Robert Gale would have been born in the late 16th century, Oliver would have lived about the time of King Henry VIII and been born in the late 15th century. In a detailed online study of the Gale family at this period, Gayle Mandell suggests that his birth date was 1471, and that he was the son of James Gale, born about 1445. As she shows, Gales (Gaylle, Gayle) are attested in Yorkshire in the 14th century as well. 'The Braddyll Family', by Sir Joshua Reynolds, 1789 (Fitzwilliam Museum, Cambridge). Jane Gale and Wilson Braddyll (who had changed his name from Gale) were cousins, both grandchildren of my ancestor John Gale of Whitehaven. The boy, later Lieutenant Colonel Thomas Richmond-Gale-Braddyll, served in the Peninsular War against Napoleon and became a Member of Parliament, as his father had been. The Gale family prospered as merchants and sea captains of Whitehaven in Cumbria in the first part of the 18th century, after my ancestor John Gale had moved there from Ireland and his son, also John (1641-1716), became the steward of the local landowner, Sir John Lowther. Much of the correspondence between Lowther and John Gale survives, and has been extensively published. The younger John's sons built up a large family business trading with the Americas, where they established interests in Maryland and Virginia and several of them settled, becoming prominent in the colonies in the decades before the American Revolution. One of the sons married the widow of the future President George Washington's grandmother Mildred, who went to live in Whitehaven with the future President's father. In England, the Whitehaven Gales were connected by business and marriage with other Cumbrian seafaring families of historical interest, including the Christians and the Wordsworths; one of my ancestors' sisters married the brother of Fletcher Christian, of HMS Bounty fame, and another married the poet William Wordsworth's brother John, captain of the East Indiamen The Earl of Abergavenney when she was wrecked off Weymouth in 1805. Extensive documentation of the Gale family during this period can be found in Chapter 3 of Gayle Mandell's website. The last of the Gales to live in India, all grandsons of the indigo planter John Gale (1809-83), included Horace Charles Macleod Gale, one of the indigo planters who met Gandhi in 1917 to discuss the conditions of work on the plantations in Bihar; his brother Major Marmaduke Henry Littledale Gale (see the blog below), murdered by disaffected Indian troops in Jhansi in 1915; their cousin Captain Maurice John Macleod Gale, a wounded Great War veteran who was assistant manager of a tea plantation in Darjeeling at the time of his early death in 1925; and their cousin, my great-great uncle Brigadier Henry John Gordon Gale, D.S.O., who commanded a Brigade of the Indian Mountain Artillery at the time of his final departure from India in 1936, having lived in garrison towns along the north-west frontier with his wife Mabel Elizabeth Gibbins - they were brother and sister respectively of my great-grandparents Helen Mary Gale and Arthur Everett Gibbins - following his return to India in 1920 after Great War service. 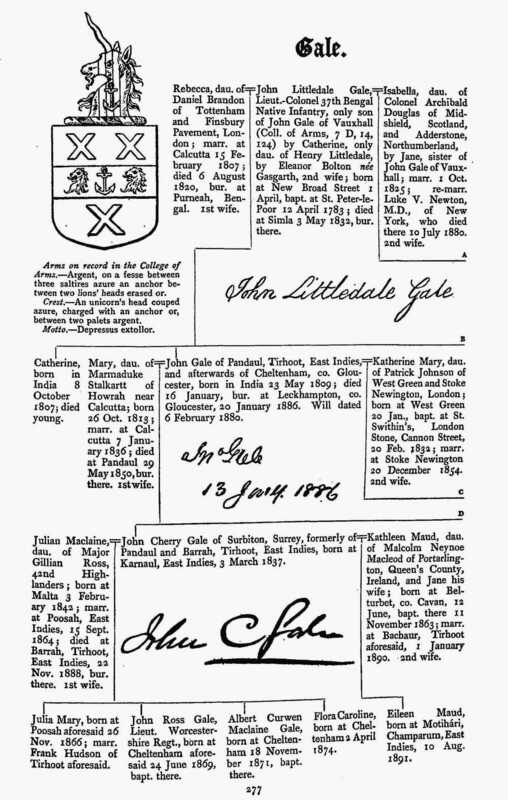 The very last of John Gale's descendants to be involved with India was my grandfather, Captain Lawrance Wilfred Gibbins, whose final voyage from Calcutta in 1963 as a captain with the Clan Line - one of the last of the East Indies shipping companies - took place almost 160 years after his ancestor John Littledale Gale first set foot in Calcutta as a Cadet of the East India Company army in 1804. Angus Gordon's book In the shadow of the Cape: a history of the Gordon family of Clifton, published in 2004. The bearded man is my great-great-great grandfather Captain Thomas Edward Gordon (1828-1918). My Scottish ancestry derives mainly from my great-great grandmother, Agnes Georgina Gordon (1856-1933), whose marriage to Walter Andrew Gale (also of Scottish ancestry on his mother's side) can seen in the charts above; their daughter Helen Mary married Arthur Everett Gibbins, and their second son was my grandfather Lawrence Wilfred Gibbins. Agnes Georgina's father, Thomas Edward Gordon, a captain in the 14th Light Dragoons and a veteran of the 1848-9 Punjab War and the Indian Mutiny in 1858-9, had been born in India in 1828. His father was a wealthy merchant in Benares named James Gillespie Gordon, the son of Thomas Gordon and Agnes Kirkpatrick of Dumfries in Scotland. Following the Mutiny, James Gillespie Gordon left India and used his fortune to buy 13,500 acres of land at Hawke's Bay in New Zealand, establishing a sheep farm - Clifton Station - that continues under the Gordon name to this day. James' son Thomas parted from his first wife, remarried and joined his father in New Zealand after leaving the army in the early 1860s. Management of Clifton Station passed through his sons to the present owner, his great-grandson Angus Gordon. Because the family still lives on the property and retains much of the original belongings - including teak furniture brought by James from India - this part of my family history is the richest in terms of surviving documents, artefacts and photographs. Angus has written an excellent book on the history of the Gordon family at Clifton Station, shown opposite. The property continues today as a sheep station and working farm, but has also been developed as a tourist attraction. You can read about the arrival of James Gordon at Cape Kidnappers in this article in New Zealand Geographic magazine. The boy in this photo, taken at Bideford, Devon, about 1915, is my grandfather Lawrance Wilfred Gibbins; behind him is his mother Helen Mary with her daughter Monica, and in the middle is Helen's grandfather Captain Thomas Edward Gordon, with two of his daughters and a niece on the right. Like his father James before him Thomas had retired to England, leaving management of Clifton Station in New Zealand to his sons, and he lived for many years in a large house in Bideford near 'Westward Ho' where he was able to indulge in his passion for golf. Because I knew my grandfather very well - he died in 1986, when I was 23 - and he remembered these visits to his great-grandfather, this picture bridges the generations for me back to the time of Thomas' birth in Benares in 1828 when India was still ruled by the East India Company. My first big breakthrough as a schoolboy researching my great-grandmother's notes was finding the Kirkpatrick of Closeburn descent in Burke's Peerage and Baronetage (see opposite; click to enlarge), showing the Kirkpatrick ancestry of the Empress Eugenie (1826-1920), wife of Napoleon III. My great-grandmother knew that her grandfather Captain Thomas Edward Gordon was a cousin of Eugenie, but the exact nature of that relationship - through his grandmother, Agnes Kirkpatrick - was something I was only to discover later, once I had found out more about the Gordon family. At the time of her marriage, Eugenie's Scottish ancestry attracted a great deal of interest, and many people with family in the Dumfries area laid claim to some connection. Much genealogical effort was put into establishing Eugenie's descent from Scottish nobility, something that was well-evidenced in the Kirkpatrick line. Like many old Scottish families, the Kirkpatrick lineage was already extensively documented - as revealed here in editions of Burke's Peerage dating from before her marriage - but the enthusiasm for her saw numerous accounts of her Scottish ancestry appear in newspapers and books, including the anonymously authored Kirkpatrick of Closeburn (1858) and Alexander de Lapere Kirkpatrick's Chronicles of the Kirkpatrick Family, dedicated to Eugenie. Recently a compilation of much of the known genealogical material has appeared as The Kirkpatrick Family Archives, a website by a descendant that provides a well-documented source for the family's history. The arms of Kirkpatrick of Closeburn. The dagger and the motto 'I make sure' (I Mak Sikkur) derive from an event in the life of Robert the Bruce, when his companion and cousin - and my ancestor - Roger de Kirkpatrick finished off 'Red Comyn' and uttered those words on raising his bloody dagger. The murder took place in February 1306, just before Bruce was crowned King. On that website you can trace the line from my five-times great grandmother Agnes Kirkpatrick (married in 1789), the mother of James Gillespie Gordon - who was father of Captain Thomas Edward Gordon, the bearded old man in the photo above - all the way back to Ivone de Kirkpatrick of Nithsdale in the 12th century, the lineage that I first saw in Burke's Peerage when I began my research. Agnes was the daughter of William Kirkpatrick, Baillie of Dumfries (died 1787), and of his first cousin Henrietta Kirkpatrick (1732-1785), respectively the son of Major George Kirkpatrick of Knock (1671-1738) and the daughter of George's brother Robert Kirkpatrick of Glenkiln (1678-1746). Robert was a Jacobite who was executed after Culloden, whereas his brother George as a young man was an officer in William of Orange's army in Ireland, arriving there in 1690 during William's war against the Jacobites. Robert was also the grandfather of William Kirkpatrick of Malaga (1764-1837), a wine merchant who married the daughter of a Spanish nobleman and whose granddaughter was the Empress Eugenie. The brothers Robert of Glenkiln and George of Knock were the great grandsons of Sir Alexander Kirkpatrick of Kirkmichael and Conheath, one of a long line of Kirkpatricks of Closeburn near Dumfries stretching back to Yvone de Kirkpatrick in the 12th century. Among many marriages over the centuries into powerful families, one of the most interesting is that of the third generation lord of Closeburn after Ivone, also Ivone de Kirkpatrick, to Euphemia de Bruce, daughter of Robert de Bruce, second Lord of Annandale (c. 1138-1194), and his wife Euphemia. The second Lord of Annandale was ancestor both of the famous Robert the Bruce, King Robert I of Scotland (1274-1329), and of his close companion Roger de Kirkpatrick (see picture caption opposite). Euphemia de Kirkpatrick's grandfather Robert de Bruce, first Lord of Annandale (c. 1070-1141), was the grandson of a Norman knight called Robert de Brus who came over with William the Conqueror in 1066. The first Lord was granted large tracts of land in Yorkshire and in Scotland, and founded the important Augustinian Priory of Gisborough. There are almost certainly other Norman antecedents who could be traced through marriages in the Kirkpatrick line, but this one is particularly interesting and represents the oldest continuous line in my family tree that can be documented. My five-times great-grandmother Mary Ann Hunter, painted about 1800 (Hunter archive). An exciting recent discovery for me has been the archive and museum of the Hunter Charitable Trust, held at Restenneth Library, Forfar, Angus, Scotland (much of which can be seen online through the subscription Scran website). The collection is built around a detailed genealogy of the Hunters of Burnside compiled by George Graham Guthrie Hunter and published as Hunters of Forfarshire 1528-1928, and includes a large collection of correspondence and other documents related to the family in the 18th and early 19th centuries. Among the material of greatest interest to me is a series of letters by William Hunter, an East India Company ship's officer and then a captain of his own ship in the 'country trade' of India, detailing his ventures across the Indian Ocean, China Sea and Pacific in the years leading up to his death by pirates off the Malabar Coast of India in 1793. William was a brother of my ancestors General David Hunter of Burnside (1765-1846) and their sister Mary Ann Hunter, pictured opposite, whose other siblings included a surgeon-general of the Indian Medical Service and a lieutenant-general in the Bengal Army. 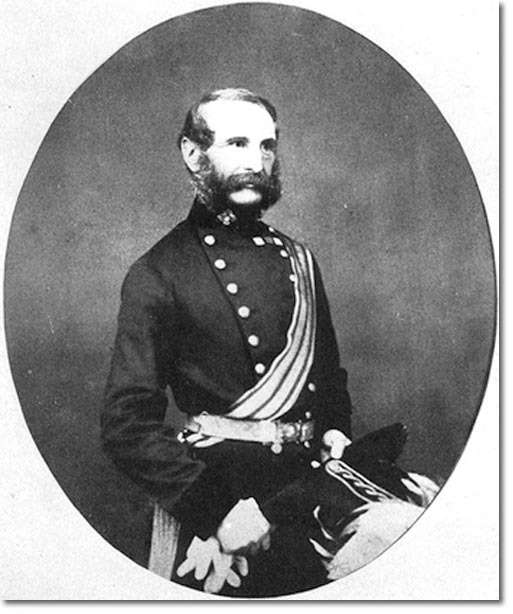 General David Hunter's granddaughter Agnes Elizabeth Hunter married Captain Thomas Edward Gordon, pictured above; they were first cousins, Thomas' mother being the daughter of Mary Ann Hunter. As a result, my great-great grandmother Agnes Georgina Gordon had the two Hunter siblings as great-grandparents. The Hunters had many military connections, including the Lawrensons, the Irish family of Agnes Elizabeth Hunter's mother. General David Hunter's and Mary Ann Hunter's mother, Elizabeth, was the granddaughter of the 10th Lord Gray of Kinfauns, one of a family who traced their ancestry back to the Normans (for more Norman ancestry, see the Kirkpatricks above). Their grandfather Captain David Hunter (born in 1721) was a Jacobite who evaded capture after the Battle of Culloden - unlike my other Jacobite ancestor, the unfortunate Robert Kirkpatrick of Glenkiln (see above) - and lived out his final years in some dissipation with Bonnie Prince Charlie's friend Lord Elcho in Venice, where David was killed in a duel over a woman in 1758. He was one of a long line of Hunters of Burnside and Dod stretching back to the earliest recorded, also David Hunter, Provost of Forfar, born in 1532.